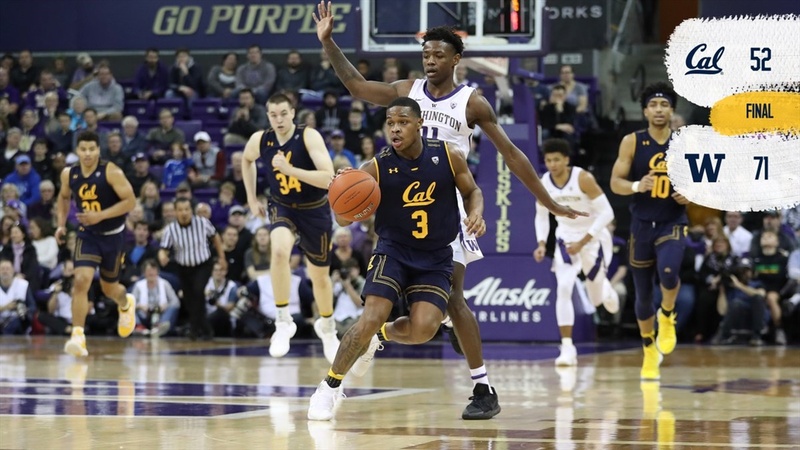 In what has become an all-too familiar story line, the Cal basketball team raced off to an early lead against Washington on Saturday afternoon in Seattle, looking sharp and confident. As the Huskies were missing all but three of their first 15 shots, the Bears built themselves a 23-11 lead with a little more than six minutes left in the first half. But those who have been following the Bears this year know that nothing is for certain, least of all a Cal lead. The Huskies buried their next three 3-point attempts as they cranked off a 7-0 run to make it close. At the 1:58 the Huskies’ Dominic Green hit a trey to give Washington its first lead. Darius McNeill answered with a three of his own to put Cal back ahead, but it was the Bears final lead. Jaylen Nowell’s layup put Washington ahead 29-28 at halftime. The Huskies just kept it up after the intermission enroute to a 71-52 victory. Cal (5-13, 0-6 Pac-12) has lost seven straight games, and the season has turned into something of a disaster. Last year’s record of 8-24, considered a major disappointment at the time, now might be out of reach. If you see three winnable games in the Bears remaining dozen conference contests you are a real optimist. The Bears built their lead on the basis of two factors, neither of which was sustained. The Huskies, one of the better shooting teams in the conference, opened the game ice cold. Some of that was traceable to Cal’s defensive effort. They contested shots and forced the Huskies to fire from places not to their liking. But part of it was just Washington flat-out missing open looks. That was not likely to continue. And it didn’t. Also in the early going the Bears were able to consistently beat Washington down the floor before the Huskies could set up their defense. That began to change as Washington asserted itself on the boards. In basketball it is hard to run a fast break without the ball. Washington finished the first half shooting just 29.2 percent from the floor, but in the second half they warmed up and were 14-for-23 (60.9 per cent), including 5-for-12 on three-pointers. Five Huskies finished in double figures scoring, led by Green with 17. He hit four of ten three-pointers. The Huskies zone defense, which head coach Mike Hopkins brought with him from Syracuse, was stifling. It seemed every time a Cal player caught the ball he was confronted by multiple defenders. Andre Kelly did have a little bit of success down low, scoring 14 as he hit six of his eight field goal attempts. Paris Austin scored 12 points, albeit on just 3-6 field goals (along with 6-8 FTs) but no other Bear really offered much offense. Justice Sueing, Cal’s leading scorer, put up just eight, on 2-11 FGs (0-5 3FG, 4-6 FTs). The 51 points is a season low, as was the 1-15 three-point shooting. Freshman guard Matt Bradley was particularly bothered by Washington’s zone. He missed all ten of his field goal tries, took no free throws, and was held scoreless for the first time in his Cal career. The Bears next take the court Thursday night at home against Colorado.